I love watching leaves fall. There's something graceful about their movement to the ground ... something refreshing about the bare branches that will one day grow leaves again ... and something beautiful about the colors. I am always amazed when I look at a branch and there's just one lone leaf. 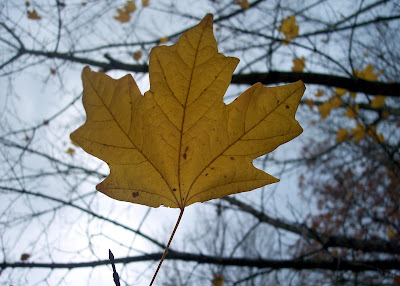 How did all the others fall, leaving just a single leaf behind? Looking out from my back porch, I can't tell where the driveway stops and the grass begins. The leaves are a beautiful distraction and perfect symbols of the changes of the season. I love this too - my old neighbor insists on picking up the leaves the moment they fall and I wish my backyard looked like yours!! I love how it looks with leaves everywhere - I just want to tell him you know dude - pick them up after everyone of them are down instead of 3 times a day!! I really like them!! 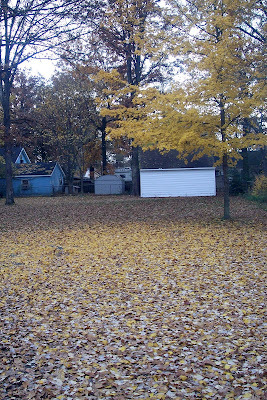 We so wish we had trees in our yard, but then we'd just have to rake and that wouldn't happen-ever.